Eastbourne Borough boss Jamie Howell has reacted to the FA Cup fourth qualifying round draw, which took place today. In the Fourth Qualifying Round of the Emirates FA Cup, the Sports will be at home to Slough Town or Bristol Manor Farm. The two potential opponents fought out a 2-2 draw on Saturday, with the Farm twice coming from behind to earn a replay on Tuesday night (9th Oct) at their home ground, The Creek. 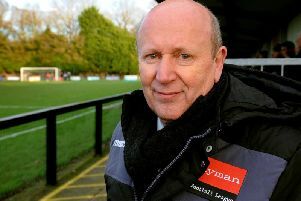 Manor Farm are among the half-dozen lowest ranked clubs left in the FA Cup, and currently sit mid-table in the Southern League South Division. Slough Town were visitors to Priory Lane only last month, grabbing a 4-2 victory in a slightly surreal 90 minutes of football - 85 of those minutes played with only ten men! "No complaints with this draw," was manager Jamie Howell's instant reaction. "You always look for a home tie, and we have avoided the big names of the National League. We do, in the nicest sense, have a score to settle with Slough Town, who in fairness played it exactly right when they nicked the win at the Lane. I have great respect for their manager Neil Baker and his staff. "They are a thoroughly nice club and, needless to say, they or Bristol Manor Farm will just as geared up for this tie as ourselves." "I confess that the Farm are not on our usual radar at all, but we will have done our homework well in advance. They are billing the Slough replay as the biggest match in their history, and they are sure to be busting a gut to get through." Ties to be played on Saturday October 20.